Hi! I'm Matt Howe, and I created, update, and run this site. Thanks for dropping by! matt [at] barbra-archives [dot] com. Here's the legal stuff about this site: Terms & Conditions. Jason's new album, Dangerous Man, is getting a digital release December 15th. The 12-track album is a mixture of standards, pop songs, and original songs. Pre-order it digitally at Amazon by clicking here. Pre-order it digitally at iTunes by clicking here. FYI, iTunes will let you download three tracks today. The rest will download on the 15th. On today's Ellen Degeneres Show, Barbra Streisand sat down to talk about the Netflix special. She has a good time with Ellen in the studio. Columbia Records has announced the upcoming release of Barbra Streisand's The Music…The Mem'ries…the Magic! album to debut on December 8th. The Music...The Mem'ries...The Magic! is the album of record for Barbra Streisand's triumphant concert tour of the same name in 2016. This collection captures the iconic songstress culminating her 13 city tour in Miami, Florida on December 5th, 2016. The album is available in two versions (track listings below): A single disc, 19-song album of memorable concert highlights, and a Deluxe 2 disc set featuring the entire concert performance. Both versions of this album are also available digitally. This career spanning collection also includes a performance of "Climb Ev'ry Mountain" with special guest, Jamie Foxx. Barbra Streisand will appear on Ellen Degeneres' daytime talk show on November 21st. Check your local listings. Barbra Streisand's docu-concert special will begin streaming on Netflix on November 22nd. Yesterday, Netflix released this preview of the show featuring Barbra's guest, Jamie Foxx. Barbra's special is an exclusive and will only appear on Netflix. Netflix is a 'streaming' ON DEMAND channel, which means that you can click on the Barbra show ANY TIME YOU WANT and watch it. It is not, therefore, limited to certain show times like the old days on HBO when you only had six chances to watch it. The Music, The Mem'ries, The Magic will be available to view on Netflix at 12:01 a.m. PST on November 22nd. That means fans on the east coast can watch it starting at 3:01 a.m. EST. I also understand that Barbra's Netflix show is available in some 200 countries simultaneously —— certainly this is Barbra's biggest television audience?! The TV special was filmed last December at Barbra's concert in Miami, Florida. The documentary footage was lensed on the last leg of her tour at the Houston and Florida shows. The concert film was directed by Jim Gable and produced by Ann Kim and Ned Doyle, while Streisand and longtime manager Marty Erlichman served as executive producers. The film was written by Streisand, Jay Landers and Richard Jay-Alexander. Below: The Netflix poster for the show. Doesn't this look AMAZING!? It begins streaming on Netflix November 22nd. According to a Netflix page and schedule that was published this weekend on their site, Barbra Streisand's concert special will begin streaming November 22nd. The concert was filmed back in December at Miami's American Airlines Arena. Documentary cameras followed Barbra during her 4-city tour to Houton, Tampa, Ft. Lauderdale and, finally, Miami. The special should be an exciting combination of live concert footage and documentary scenes. At the Miami show, Barbra also included Patrick Wilson and Jamie Foxx for duets. Netflix describes the special as "dazzling ballads, Broadway standards and stories from behind the scenes." Netflix has not published a press release, nor a trailer for the special yet — but we can only assume those are due to hit the internet very soon. Also, no word on when the special will begin streaming in Europe. Wait for the official release for all the info. Barbra Streisand's Encore duet partner, Alec Baldwin, interviewed Barbra at her house for his WNYC podcast, Here's the Thing. You can stream it or download it here. Saturday, Oct. 7th, Musicians at Play, Music Fund Los Angeles, and Varèse Sarabande presented composer Lalo Schifrin’s 85th Birthday Concert at the historic Alex Theatre in Glendale. Alan Bergman sang “On Rainy Afternoons” — a song that Schifrin wrote, with the Bergmans supplying lyrics. The song was included on Barbra’s “Wet” album. Barbra herself sent a video tribute explaining how she came to record the song, and wishing Schifrin a happy birthday. Becoming Barbra: The Young Streisand from New York to Paris is a new book of rare, unpublished photos and text by Bill Eppridge. It is a hardcover book from Rizzoli, due April 3, 2018. PRE-ORDER FROM AMAZON.COM HERE. Barry Dennen, Barbra's friend from her early days in New York, has died. He wrote a book about their early days together and how they developed Barbra's early nightclub act, which he recorded on reel-to-reel tapes. Dennen tried to sell the tapes many years later. He lived a long life and had an acting career most noted for his portrayal of Pilate in Jesus Christ Superstar. READ MORE. 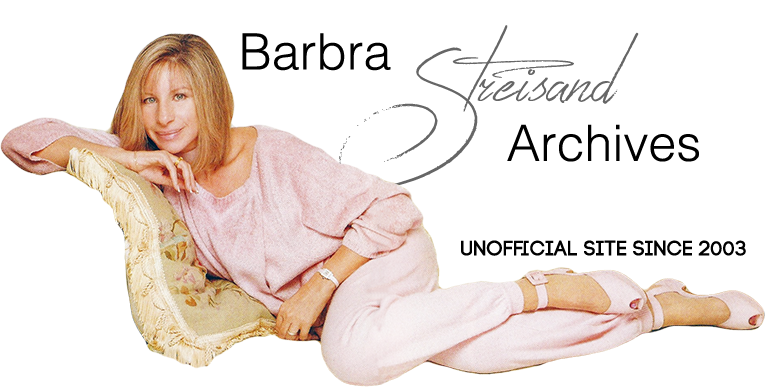 Juliens Auctions has several Barbra Streisand items up on its site for the upcoming Nov. 17th auction. LOOK AT THE ITEMS HERE. Twilight Time reports that their Funny Lady Blu-ray has now SOLD OUT. I hope, if you collect Barbra's movies on Blu-ray, that you were able to get this one. TT produced a limited run (3,000), and now they are gone. Hopefully greedy sellers won't be auctioning the discs on eBay with inflated prices! Twilight Time's Yentl Blu-ray is STILL AVAILABLE SOLD OUT (as of 9/29) VISIT SCREEN ARCHIVES. The Hollywood Reporter ran a short clip of Barbra's on screen remarks for a new documentary, Never Stop Dreaming: The Life and Legacy of Shimon Peres. WATCH THE VIDEO HERE. All About Barbra magazine #82 is available for pre-order right now. VISIT AAB TO ORDER. The one-hour special will be based in Los Angeles with stages in New York, Nashville and a special performance by Country Music icon and Texas native George Strait from his San Antonio benefit concert. Hand in Hand will air live on ABC, CBS, CMT, FOX and NBC on Tuesday, September 12, 8:00-9:00pm EST on the East Coast and replay 8:00-9:00pm PST on the West Coast. The show will also be available internationally via live stream on Facebook, YouTube and Twitter starting at 8:00pmEST during the first broadcast. Hand in Hand will bring the country together to raise funds, spirits and help rebuild Texas in the wake of this unprecedented devastation. Proceeds from the telethon will benefit United Way of Greater Houston, Habitat for Humanity, Save the Children, Direct Relief, Feeding Texas and The Mayor's Fund for Hurricane Harvey Relief (administered by the Greater Houston Community Fund) through the Hand in Hand Hurricane Relief Fund managed by Comic Relief USA. The broadcast will feature appearances, performances, taped tributes and messages from some of the nation's biggest stars including George Clooney, Jamie Foxx, Karlie Kloss, Beyoncé, Matt Lauer, Rob Lowe, Matthew McConaughey, Norah O'Donnell, Dennis Quaid, Julia Roberts, Kelly Rowland, Adam Sandler, Ryan Seacrest, Michael Strahan, Blake Shelton, Strait, Barbra Streisand, Oprah Winfrey and Reese Witherspoon with more to be announced. Strait, a Country Music Hall of Fame member who is leading the country music world in these efforts, will perform directly from his benefit concert at San Antonio's Majestic Theatre. The Hand in Hand broadcast will be produced by SB Projects and Den of Thieves with Scooter Braun, Bernard 'Bun B' Freeman, Allison Kaye, Jesse Ignjatovic and Evan Prager serving as Executive Producers. Additional Executive Producers are Chris Choun, and Lee Lodge with Jordan Brown, Penni Thow and Barb Bialkowski serving as Co-Executive Producers. Barbra Streisand posted yesterday that her dear dog, Sammie, passed away. For anyone who's ever lost a furry friend, this is devasting news. Fans have been posting kind words at Barbra's official Facebook page and on social media. My condolences to Barbra and her family ... our pets are so precious to us! Last night on James Spada's Facebook page, his friend and caretaker told us that Jim had passed away after some health issues the last few months. This is such sad news. James Spada was a true Streisand fan who wrote several Streisand bios that you all will know ("The First Decade", "Her Life", and the beautiful 2014 book "In the Camera Eye.") And he worked on the 1980s fanzine, "Barbra." Before the internet, Spada's Streisand books were invaluable ... I must have read Barbra: The First Decade hundreds of times! Jim was so prolific, with other books on Bette Davis, Marilyn Monroe, Katharine Hepburn ... and then there was his photography. Truly talented. He was always so nice to me, and generous. Rest in peace, James Spada. I've posted Barbra's Long Island and Brooklyn shows over in the LIVE section of this website — set lists, photos, and a report about each show. They were really special, and Barbra was in great form! I also have posted a new page dedicated to Barbra's 70-minute interview at Tribeca Talks. What is there to look forward to next from Barbra? Well, the television special of The Music, The Mem’ries, The Magic concert will air on Netflix in December 2017. They filmed the Miami show in December 2016, and Jami Foxx and Patrick Wilson will be on the Netflix special, singing with Streisand. Barbra, of course, is writing her memoir. Still no release date on that, though. Certainly, Barbra will record soon, as well. She has said that her next album would not be comprised of duets. On Sunday, April 30, Barbra Streisand saw the matinee show of Dear Evan Hansen on Broadway. BELOW: The cast Michael Park, Will Roland, Ben Platt (the star of "Dear Evan Hansen"), Barbra Streisand, Rachel Bay Jones, Jennifer Laura Thompson, Laura Dreyfuss and Mike Faist. BELOW: Ben Platt and Barbra backstage. I'm just back from seeing Barbra Streisand at the Tribeca Film Festival at the BMCC Tribeca Performing Arts Center. It was great fun to hang out (for hours!) with other Barbra fans in line, anxious to get close to their idol who was talking about her film career in a rare public appearance. Thanks to the amazing Joe Naughton for these fan photos!! Rodriguez may have been a strange pairing with Barbra but — based on his family history with Streisand (a strong mother who watched her movies) — IT WORKED! The big surprises, for me, were (1) her honesty about director Frank Pierson for A STAR IS BORN. That's the first time I've heard Barbra give solid examples of how they clashed. (2) her passion for the cut scenes from THE WAY WE WERE and how that really motivated her to become a director. (3) her willingness to engage and talk about (a little!) sexism in regards to her career in Hollywood. "A lot of you are probably wondering why I'm here," Rodriguez said to the crowd. Apparently, his Streisand fandom dates back to his boyhood, growing up in a 10-child household in San Antonio, TX. "In our household, there was no bigger star than Barbra Streisand," he explained to a crowd that needed no converting. "My mom loved to talk to her 10 children about two things: God and Barbra Streisand." Over the course of 70 minutes (which included a Q&A section at the end) Streisand and Rodriguez talked about her legendary filmography, her pioneering work as a female director and why you can't bring up walls in her presence. Here are a few highlights. "I learned to despise the media [working on that movie]. Every time I had a suggestion [on set] it was put in the paper like we were fighting." Why? "Opinions weren't popular in the '60s with women." In real life, she said she got along quite well with "Willy Wyler," recalling that he would run dailies by her and that they kept in touch until his death. "That was tough," she recalled of working with director Frank Pierson on the 1976 remake of A Star Is Born. "I was, in a sense, blackmailed into having that director," she said, explaining that Pierson used his script as leverage to get into the director's chair. "I would say I'm an actress first, only because I started singing because I couldn't get a job as an actress, and I started directing because I couldn't be heard as an actress." While Yentl received praise in many quarters, Streisand said she tends to forget good reviews and focuses on the negative ones instead. Looking back on it now, she admitted, "[The criticism] must have hurt me more than I thought because I didn't want to direct for years after that." "Johnny Mathis. He was so beautiful, those dark eyes…. And he seemed like he was in pain a bit. I'm always drawn to pain." "There's less people to argue with." "I love when I see a woman's name on a movie and I pray it's good." Streisand: "Fear is an engine to create." Rodriguez: "That's great – you turn fear into an engine, not a wall." Streisand: "Don't mention a wall to me." Last night at Rande Gerber's Malibu restaurant Cafe Habana, Barbra Streisand celebrated her 75th birthday surrounded by her family, good friends, colleagues, and more. Attending were Gerber's wife Cindy Crawford, David Foster, Pierce Brosnan, Josh Brolin and James Brolin, Quincy Jones, Richard Marx, his wife Daisy Fuentes, Rosanna Arquette, and Katharine McPhee. Also, Donna Karan, photographer Russell James, and Carole Bayer Sager. Marilyn and Alan Bergman attended as well. Team Barbra was there: Marty Erlichman, Jay Landers, Richard Jay-Alexander, and Tracy Quinn. Barbra's sister Roslyn Kind and son Jason Gould attended. John Mayer and Babyface (Kenny Edmonds) sang for Barbra — Edmonds sang “Evergreen.” Also, magician Jon Dorenbos performed magic for the crowd. Barbra Streisand celebrates her birthday today. You're the best, and I'm so grateful that you're still recording and concertizing ... I hope your special day is filled with love and laughter, friends and family ... and delicious food! She's excited to be the chairwoman of the board for the performing arts center at the World Trade Center. She's looking for a new film project to direct. She's had offers to sing in Europe and Latin America, but says the May concerts in NY will be the last shows supporting her #1 album, Encore. She feels it is important and "bigger than me" to speak out about Trump. Last night, Barbra Streisand presented NBCUniversal vice chairman Ron Meyer with the Simon Wiesenthal Center's Humanitarian Award at the organization's 2017 National Tribute Dinner — the Oscars for L.A.'s Jewish community — on April 5 at The Beverly Hilton. Barbra Streisand's signature song, "People," has been deemed worthy of preservation as part of America's heritage by the Library of Congress. Barbra Streisand will be at the Tribeca Film Festival! Tribeca Talks: Storytellers, which spotlights pioneering creators who work across mediums to tell their stories, will feature Barbra Streisand in conversation with director Robert Rodriguez. Barbra will converse on her unparalleled career and force field of creativity. $40 Tickets for Tribeca Talks go on sale 11am on Tuesday, March 28, and can be purchased online at www.tribecafilm.com, by telephone(866) 941-FEST (3378), or at the ticket outlet located at Cinepolis Chelsea (260 W. 23rd Street). Streisand plans to reprise last year’s “The Music . . . The Mem’ries . . . The Magic!” tour with two special shows she is calling “The Encore” at Nassau Coliseum on May 4 and Barclays Center on May 6. Tickets for both shows will go on sale to the general public at 10 a.m. EST Feb. 10 through Ticketmaster. On Saturday, January 21, 2017 women and men marched peacefully in solidarity for the protection of their rights, their safety, their health, and their families — recognizing that our vibrant and diverse communities are the strength of our country. Marches held in more than 500 U.S. cities were attended by at least 3.3 million people. This event was possibly the largest demonstration in U.S. history. In Los Angeles, Barbra Streisand partipated in the march. Introduced by Rufus Wainwright, Barbra appeared on stage and made a speech. Barbra also posed for several “selfies” with her fellow marchers. Barbra's speech has been posted on her official site. Click here to read it. I am proud that Barbra Streisand participated and spoke. She is, first, a citizen. And you can read her thoughts on the artist as citizen here. Barbra's son, Jason Gould [@JasonGouldMusic on Twitter, and Facebook too], is working on new music with Quincy Jones. He has been posting photos of himself and Q at work in the recording studio. I'll post more info when it's available, but it looks like a new recording from Jason will be out soon! Editor Lynne Pounder has revealed the cover of All About Barbra magazine issue #81. Check out the AAB site for more info. They will be posting links to order the magazine soon. Lynne says #81 will be out in February 2017. Los Angeles! Barbra's hilarious 1972 film, What's Up, Doc? will be screened during the Turner Classic Movies Classic Film Festival, held April 6-9, 2017. Visit their site for more info. They have advertised that director Peter Bogdanovich will attend and speak. At Showbiz 411, Roger Friedman reported that Barbra Streisand will perform this Spring at the newly renovated Nassau Coliseum in Long Island, NY. There are no official dates or information yet ... stay tuned! All of the 2016 news has been archived on this page (click to read). Last night, Barbra Streisand appeared in person at The GRAMMY Museum® at L.A. LIVE. Presented by American Express, A Conversation With Barbra Streisand was moderated by GRAMMY Museum Executive Director Bob Santelli. Billboard published a great summary of what Streisand and Santelli discussed — you can read it here. On her drive: “It's a combination of confidence and enormous self doubt. You're always afraid that you're not good enough but you know you have the vision. You can see yourself doing it and you have to make it happen." Barbra is looking back at 20 or so journals that she has kept going back 25 to 30 years. When recording, Barbra only likes to do a maximum of four vocal takes. Barbra says she has two more dates in New York in the calendar: one in Nassau County, the other around the TriBeCa Film Festival. Barbra wavered on any questions surrounding future tours. Regarding a new album: Barbra teased that her next one could be a solo record. Barbra Streisand has been nominated for Best Traditional Pop Vocal Album (Encore: Movie Partners Sing Broadway). The Grammys air February 12, 2017. Barbra hasn't won a Grammy for her recording work since 1987 (The Broadway Album) !! It seems like she is majorly overdue for this honor. Billboard has posted its 2016 year-end charts. The music industry magazine places Barbra's #1 album Encore: Movie Partners Sing Broadway at #127 for the year. Streisand fans in Washington, D.C. .... The American Pops Orchestra presents “Don’t Rain on My Parade: 75 Years of Streisand” on January 13, 2017 at 8 PM at Lisner Auditorium. Fran Drescher (The Nanny) will host. Legendary artist and ten-time Grammy winner Barbra Streisand marks her 75th birthday in 2017. Celebrating this iconic star and songs from Broadway to Pop and everything in between, this program demonstrates why the music of Barbra Streisand remains a centerpiece of the American Songbook and why, much like a milestone birthday and the artist herself, her music deserves great celebration. With a parade of special Broadway guests, including Amber Iman, Lindsay Mendez, Laura Osnes, and more!